Workman Publishing Company, 9780761176411, 256pp. Welcome to a world where little people have big personalities. A world that’s upside down and yet weirdly, wonderfully real. A world where Lilliputian thieves poach strawberry seeds. Where it takes a guy with a jackhammer to pop open pistachios. Where skaters fall into a crack in the crème brûlée, and teddy bear cookies congregate with evil intent. Happiness, hope, adventure, pride, love, greed, menace, solitude—it’s our world, seen through a singularly unique and funny lens, in more than 100 scenes from breakfast through dessert. 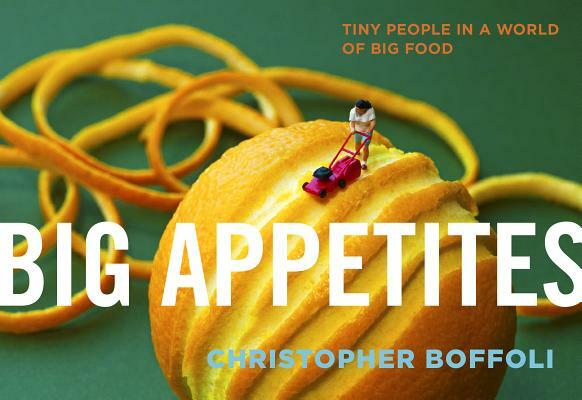 Christopher Boffoli was nominated for a James Beard Award for his food photography, and his Big Appetites series has been featured in The Washington Post and on NPR, The Chew, the Huffington Post, Oprah.com, and other media outlets around the world. He also works as a writer and photojournalist and lives in Seattle, Washington. "Christopher Boffoli won’t stop playing with his food, and we couldn’t be happier about it." "Christopher Boffoli makes awesome art with tiny people and normal-sized food." "Seattle-based photographer/photojournalist Christopher Boffoli turns the world upside down in his charming book Big Appetites."